It is December and the weather outside is frightening! So, what is happening to your pool outside in this weather? People tend to think that once the pool is closed there is nothing left to worry about until the opening. 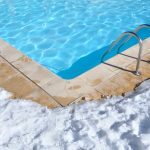 However, by implementing some minor winter pool care steps, you can increase your chances of opening up a clean, clear, and intact pool come spring. When the pool was closed, some chemicals may have been added such as chlorine and algaecide to help prevent algae growth over the winter. Checking under the cover a few times throughout the winter season and monitoring algae growth is good preventative maintenance. By keeping an eye on your water, you can help to prevent an algae bloom come spring. Also during your pool closing, the water level should have been drained below the skimmer, the lines blown out to emit all water from collecting in them and then plugged. This process will help to prevent against freeze and thaw damage to piping from fluctuating temperatures. 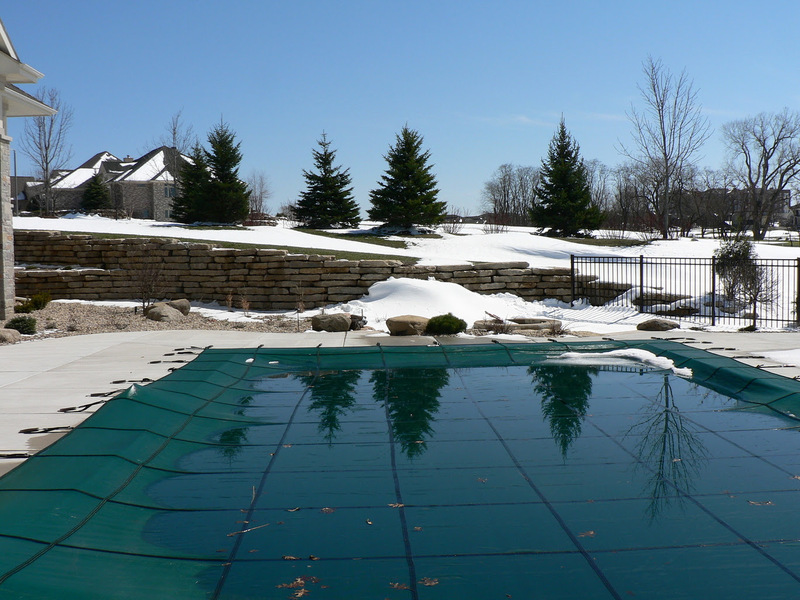 Ideally, you have your pool safety cover securely in place to prevent access to your pool during the winter season. However, this does not mean things will not accumulate on the cover. It is best practice to keep the pool cover clean and clear during the cold months. This will help to protect the longevity of your cover. For safety covers, do not allow snow to sit on the cover. It can stretch the cover and straps and shorten the lifespan of the cover. After a heavy snowfall you can use the pool brush to carefully brush snow off of it. If you have an above ground pool, you should be utilizing a pool pillow under the cover to keep the cover elevated above the water level in the pool. You want to check that pillow to make sure it remains properly inflated throughout the winter. Your cover and straps may need some adjusting which your pool company can easily do. Monitoring your pool’s water level during the winter months is also important. 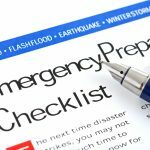 Decreasing water levels can be an indication of a leak. If that is the case, you want to make sure that you are adding water to help protect the pool. If a gunite pool leaks out, it has the possibility of succumbing to hydrostatic pressure and floating out of the ground like a boat. If a liner pool has a leak and drains out, the liner could sustain irreparable damage and require replacement. On the other hand, water levels that are too high can also be damaging to the pool. Cover pumps can help in maintaining proper water levels in the pool. We have year-round pool professionals on staff for your winter care service. Our Winter Watch Program is available to help take care of your pool during the winter season. Contact us today to develop your customizable Winter Watch Program.